Well got off to a flying start Monday as I made slabs for two more slab vases - as I want to continue working on them. However stalled after that as had to glaze slab vases that I had made pre-Stephen Hill as we were loading the gas kiln on Tuesday. Our daughter's boy friend Ken, was arriving in the afternoon, to drop off their dog. We'll be looking after their dog until they have finished moving to Toronto from Victoria in September. Loaded the kiln on Tuesday and fired on Wednesday. It was the smoothest firing that we had done so far - needed very little adjustment of gas, air, damper after body reduction. I decided to reox the kiln after cone 9 was down as that was something Stephen said he did for the last hour from 9 to 10. Also did a bit of a slow cool from 04 for about an hour and a half. I have been having a lot of trouble with blistering with fake ash glazes on my iron stoneware, even after a slow bisque. Opening the kiln on Friday - the results were really great - great copper reds and hardly any blistering on the fake ash. We'll try to repeat again in the next firing. Managed to put together the slabs and so have 2 vases ready for decorating. Thurs - Friday had to help get things ready for our big Raku firing for our Summerfest on Saturday. This is held in Deep River every second year, with music, crafts, etc. The Guild makes small pots for the public to glaze and raku. This is very popular - we sold out of pots (152)and so raised approx $1200. The pots are sold at $8, but if people had a Summerfest wristband (cost $20 that allowed them to see all the music events), they got a $4 discount on the pot and the Summerfest committee then makes up the difference to us. We were a pretty tired out, smoky crew at end at 5 pm. We also had a pottery sale and sold about $900. In Dec 2009 I renamed my first blog to Centered - Focus on Clay and Creativity - as I have finished my year long journey workshop with Steven Hill. The focus will continue to be on thoughts about my work - about creativity, design and function................... 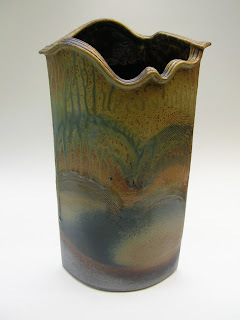 I have been making pottery off and on for 40 years, exploring many different aspects of ceramics. I named my pottery business after "The Newfoundout" - the secluded valley high in the Opeongo Hills of eastern Ontario where we own an abandoned farm and where in 2007 I built a wood-fired kiln. I normally fire in a gas kiln in Deep River, Ontario, at the Deep River Potters' Guild, but do several wood firings in the summer. This blog originally documented my year long "journey workshop" with Steven Hill. It was an incredible "journey" which had a profound effect on my work and as was the North Bay mentorship. I highly recommend this type of workshop to anyone who is interested in exploring their work and creativity. Journey Aug 18-24 "What Do You Think"
Journey day 9 "The Contract"